When creating a recording using the GoVideo Chrome extension, Vidyard temporarily keeps your video in the local storage space utilized by Google Chrome. If you experience network problems while using GoVideo, recording will continue as normal. 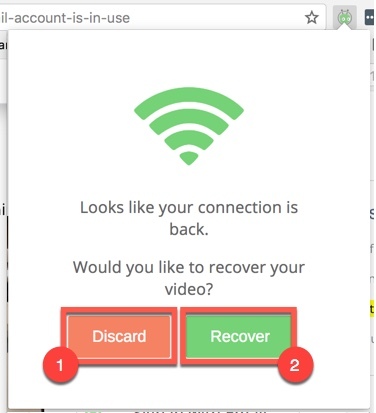 You will have the option to recover the video once the quality of your internet connection has improved. Check your internet connection. It may not be performing optimally. Re-open the GoVideo Chrome extension. You will be prompted to either Recover or Discard your recording. 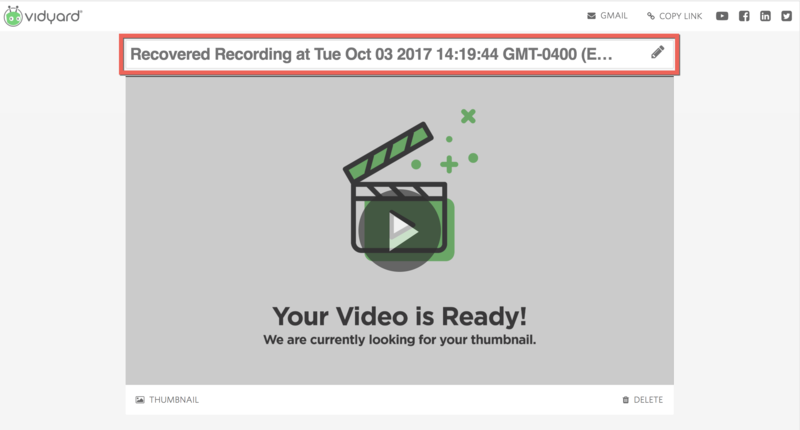 If you choose Recover, Vidyard will begin to upload your recording to a GoVideo sharing page. Note: if the upload fails again during recover, try again. Your internet connection may not yet be optimal enough to recover the video. Note: Your video will begin to encode once recovered. Your video can be viewed, but it will not immediately have a thumbnail, show your position in the video during playback, or allow you to seek to another location. These features will appear in several minutes once encoding has finished. What if I have no space in local storage? If you do not have available space in local storage, Vidyard will not prevent you from recording. However, should your video fail to upload, Vidyard will be unable to recover it. How much local storage space do I have available? You can check how much local storage space is being utilized by Chrome in the browser console. Click on Clear storage. This tab will indicate usage and available space. Make space accordingly. How much of my local storage space will Vidyard use? Vidyard will temporarily use only as much storage space as the size of your video requires. Once the video uploads to a GoVideo sharing page, it will be removed from local storage.